Since orthopedic surgeons began using a tiny TV camera called an arthroscope to diagnose and treat shoulder problems, they have discovered several conditions that no one knew existed. One of these conditions is an injury to a small structure in the shoulder called the labrum. 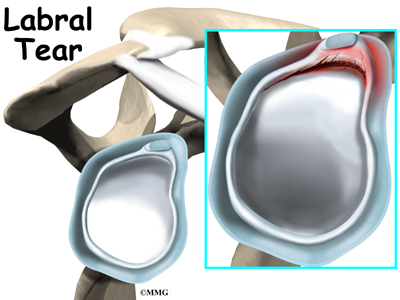 A labral tear can cause pain and a catching sensation in the shoulder. Labral tears can be very difficult to diagnose. A part of the scapula, called the glenoid, makes up the socket of the shoulder. The glenoid is very shallow and flat. The labrum is a rim of soft tissue that makes the socket more like a cup. The labrum turns the flat surface of the glenoid into a deeper socket that molds to fit the head of the humerus. Tendons attach muscles to bones. Muscles move the bones by pulling on the tendons. The rotator cuff helps raise and rotate the arm. As the arm is raised, the rotator cuff also keeps the humerus tightly in the glenoid of the scapula. 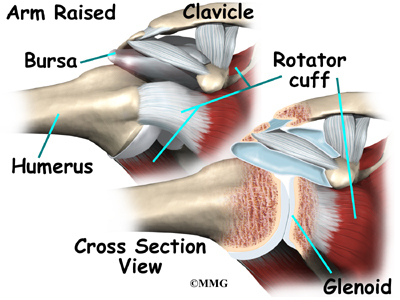 The soft labral tissue can be caught between the glenoid and the humerus. When this happens, the labrum may start to tear. If the tear gets worse, it may become a flap of tissue that can move in and out of the joint, getting caught between the head of the humerus and the glenoid. The flap can cause pain and catching when you move your shoulder. Several tendons and ligaments attach to the labrum that help maintain the stability of the shoulder. So when the labrum tears, the shoulder often becomes much less stable. Labral tears are often caused by a direct injury to the shoulder, such as falling on an outstretched hand. The labrum can also become torn from the wear and tear of activity, a condition called overuse. An injured labrum can lead to shoulder instability. The extra motion of the humerus within the socket causes additional damage to the labrum. An extremely unstable shoulder may slip or dislocate. This can also cause the labrum to tear. The biceps tendon attaches to the front part of the labrum. The biceps is the large muscle on the front of your upper arm. Sports can cause injuries to the labrum when the biceps tendon pulls sharply against the front of the labrum. Baseball pitchers are prone to labral tears because the action of throwing causes the biceps tendon to pull strongly against the top part of the labrum. Weightlifters can have similar problems when pressing weights overhead. Golfers may tear their labrum if their club strikes the ground during the golf swing. What does a labral tear feel like? The main symptom caused by a labral tear is a sharp pop or catching sensation in the shoulder during certain shoulder movements. This may be followed by a vague aching for several hours. At other times, the tear may not cause any pain. Shoulder instability from a damaged labrum may cause the shoulder to feel loose, as though it slips with certain movements. Your doctor may suspect a labral tear based on your medical history. You will be asked questions about your pain and past injuries to your shoulder that may suggest labral damage. In the physical examination, there are several shoulder movements that can bring on the symptoms. You may feel a catching sensation as your arm is raised, and there may be pain when the arm is held overhead. If your arm is held in front of your body, with the palm of the hand facing downward, you may feel pain when your doctor tries to push down on your arm. Labral tears are difficult to see, even in a magnetic resonance imaging (MRI) scan. An MRI scan is a special imaging test that uses magnetic waves to show the tissues of the shoulder in slices. The MRI scan shows soft tissues such as tendons and ligaments as well as bones. Labral tears may be seen using computed tomography (CT) scan and a special dye. A CT scan is an older test that uses computer-enhanced X-rays to show slices of the shoulder. The soft tissues do not show up in a CT scan, but the special dye does. The dye shows the outline of the labrum. If there is a tear, the dye may leak into it and show up on the CT scan. However, MRI and CT scans are not very accurate in detecting labral tears. Confirming the diagnosis of a labral tear can be extremely difficult. A surgeon may need to look into your shoulder using an arthroscope. The arthroscope is a small TV camera that is inserted into the shoulder joint through a very small incision. The surgeon can then see pictures of the joint on a TV screen. This allows the surgeon to look directly at the labrum to see if it is torn. Your doctor will probably have a physical or occupational therapist direct your rehabilitation program. Your first therapy treatments will try to ease pain and inflammation by using such treatments as heat or ice. Hands-on treatment and various types of exercises are used to improve the range of motion in your shoulder and the nearby joints and muscles. Later, you will do strengthening exercises to improve the strength and control of the rotator cuff and shoulder blade muscles. Your therapist will help you retrain these muscles to keep the ball of the humerus in the glenoid. This will improve the stability of your shoulder and help it move smoothly during all your activities. You may need therapy treatments for four to six weeks. Most patients are able to get back to their activities with full use of their arm within this amount of time. If your symptoms don't go away, you may need surgery. Surgical treatment for this condition is still evolving. Surgeons have not known about the problem long enough to adequately evaluate the results of different treatments. 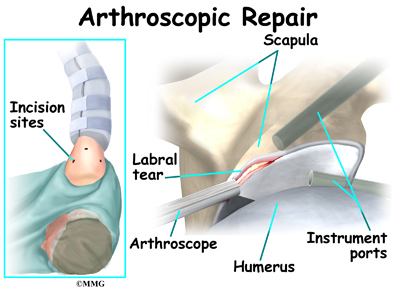 The arthroscope is commonly used to treat many labral tears. If the tear is small and is mostly getting caught as you move the shoulder, simply removing the frayed edges and any loose parts of the labrum may get rid of your symptoms. This is called labral debridement. If the tear is larger, the shoulder may also be unstable. If this is the case, the labral tear may need to be repaired, rather than simply removed. 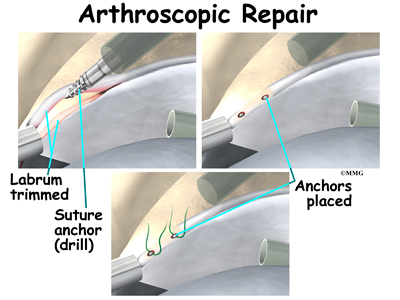 Several new techniques allow surgeons to place âanchorsâ into the bone around the shoulder joint and reattach the labrum using the arthroscope. There are many variations of these anchors, but most are drilled into the bone and have sutures (stitches) attached that are then used to tie the labrum down to the bone and enable the labrum to heal back in the appropriate position. Open procedures are rarely used today for repair of labral tears. The arthroscopic techniques have become increasingly refined and are today the preferred method of treatment. If for some reason the tear is repaired open, the surgeon will need to make an incision in the front of the shoulder. The main drawback of making the larger incision is that it will probably take you longer to recover from surgery. Even nonsurgical treatment requires a rehabilitation program. Some evidence suggests that shoulder instability may eventually make labral tears worse. The goal of therapy will be to strengthen the rotator cuff muscles to make the shoulder more stable. At first you will do exercises with the therapist. Eventually you will be put on a home program of exercise to keep the muscles strong and flexible. This should help you avoid future problems. Rehabilitation after surgery is more complex. You will probably need to wear a sling to support and protect the shoulder for several weeks after surgery. A physical or occupational therapist will probably direct your recovery program. Depending on the surgical procedure, you will probably need to attend therapy sessions for one to two months, and you should expect full recovery to take up to four to six months if you are expecting to participate in athletics. Getting the shoulder moving as soon as possible is important. However, this must be balanced with the need to protect the healing tissues. The first few therapy treatments will focus on controlling the pain and swelling from surgery. Ice and electrical stimulation treatments may help. Your therapist may also use massage and other types of hands-on treatments to ease muscle spasm and pain. Therapy proceeds quickly after a simple arthroscopic surgery to clean up the frayed edges or loose parts of the labrum. Sessions start with range-of-motion exercises and gradually work into active stretching and strengthening. Overhand athletes start their sports gradually within four to six weeks. They can usually return to competition within three months. After surgery to repair the labrum, therapists usually begin with passive exercises. In passive exercises, the shoulder joint is moved, but your muscles stay relaxed. Your therapist gently moves your joint and gradually stretches your arm. You may also be taught how to do passive exercises at home. Active therapy starts about six weeks after repair surgery. Active range-of-motion exercises help you regain shoulder movement using your own muscle power. Light isometric strengthening exercises are started about this time. These exercises work the muscles without straining the healing joint. By about the tenth week, you will start more active strengthening. Exercises will focus on improving strength and control of the rotator cuff muscles. They help tighten the ball of the humerus in the glenoid socket and can improve the stability of the shoulder. A stronger and more stable shoulder helps keep the ball of the humerus centered in the socket during all your activities. Some of the exercises you will do are designed get your shoulder working in ways that are similar to your work tasks and sport activities. Your therapist will help you find ways to do your tasks that don't put too much stress on your shoulder. Before your therapy sessions end, your therapist will teach you a number of ways to avoid future problems.